Mengku contains the largest distribution of wild tea trees in Lincang. It is the highest elevation and densest currently known group of large leaf variety tea trees growing on earth. These trees grow on the middle and upper reaches of the Shuangjiang County and are scattered over more than 12,000 mu. 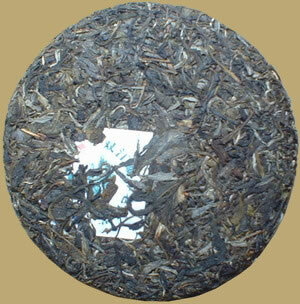 This raw Pu-erh cake was compressed by stone mold - traditional Bingcha processing method to avoid breaking tea leaves. The tea can be drank now and enjoyed by those who appreciate the fresh, bitter, and sweet tastes experienced throughout 10-20 infusions, or put away for aging.